When planning an informal work lunch this week, I reached out to several catering companies to provide the meal. This became tricky because the luncheon was being held off-site, roughly three hours from my home, and my budget was tight. When I quickly added up costs related to preparing and delivering food for the group, I realized that ordering from a local caterer was going to be a far too expensive option. As I searched my mind for an alternative, I was reminded of this recipe for a hearty soup that would hit the spot as the weather forecast predicted rain and 45 degree temperatures for the day. Adding a few other lunch items to the menu would round out the meal. I ended up ordering a 4-ft. long sub sandwich from the deli department of the area grocery store. I picked up a large vegetable tray and a case of bottled water. Finally, I headed to the store bakery and purchased a box of freshly made oatmeal cookies for the group. I paired this soup with all of the other items that I had purchased and covered the tables with seasonal table clothes. Returning to our meeting room, I quickly popped all of my purchased items in the fridge and plugged in my trusty, 6-quart crockpot. I opened all seven cans and popped them into the slow cooker. Lunch would be served in three hours, so I had plenty of time to warm the soup and meld the flavors. Last, but not least, I crumbled up a bag of Frito’s Corn Chips and opened a package of sharp cheddar cheese to sprinkle over the top of the individual bowls of soup. This step is the game changer; bringing this ridiculously simple soup over the top. The warm hearty soup, paired with a topping of slightly melted cheese and crunchy corn chips really makes for a mighty good, super quick and easy lunch idea. 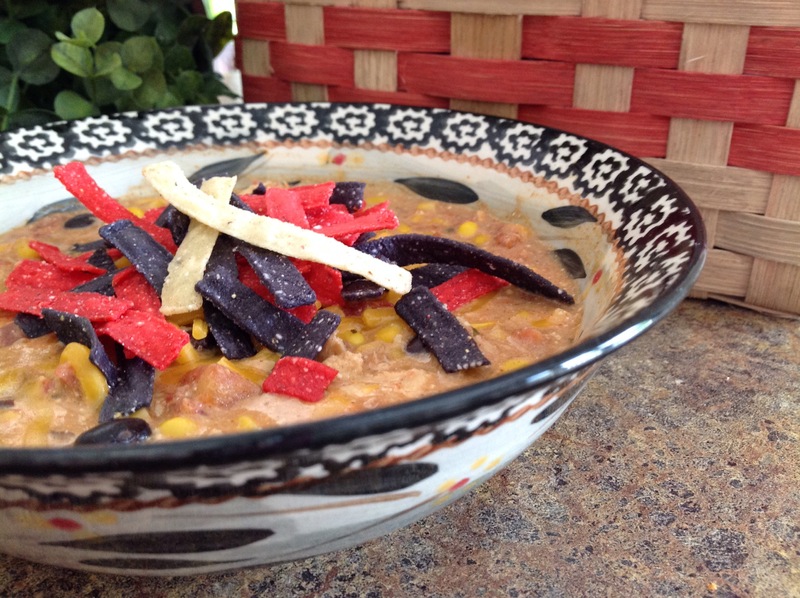 Serve topped with crushed Frito or Dorito Corn Chips and shredded cheese. Note: Can sizes listed above are approximate; this is a very forgiving soup recipe. Add water or extra broth, if needed. Also, use lower sodium versions of the canned products, if your concerned about salt. If you’d prefer to use fresh chicken breasts for this recipe, use about 1 1/2 cups of cooked, diced chicken. My daughter was recently invited to a surprise party for a co-worker. She had just started working at the facility and was excited to spend time outside of work with this fun group of coworkers. After the party, she commented that she had a great time and was so happy to be included. Later, she told me about one of the items on the menu for the event that evening. She called it “white chili” and tried her best to describe all of the flavors she experienced while tasting the flavorful dish. Several days later, I found the recipe as it was placed on my kitchen counter. Her coworker had neatly typed up the recipe for many attending the party had requested a copy. After looking over all of the ingredients, I was delighted to find that most items were already in my kitchen fridge and pantry. We were experiencing a cooler than normal spring day so I pulled out my crockpot and threw all of the ingredients in (with a few minor changes). Add all ingredients to the crockpot; except cilantro. Cook 6 hours on high or 8 hours on low setting. Shred chicken 30 minutes before completed hours, return to crockpot and add cilantro. When serving, top with tortilla strips and pour over tender noodles or cooked rice. While St. Patrick’s Day is long past and Easter is just around the corner, I recently searched the freezer to see what kind of inventory I had available in the way of meat products for the coming holiday. (I often have a supply of ground beef, ham, pork, or prime rib roast left from thrifty bulk purchases when I find a great deal at the supermarket.) To my surprise, I had several corned beef roasts set on the top shelf. I quickly remembered that I had bought a boat load of corned beef around St. Patrick’s Day because the price was too good to pass up. Five roasted were neatly stacked in the freezer so I put one in the fridge to thaw for Monday’s dinner. Before I headed to work on Monday morning, I lined the bottom of my crockpot with potatoes, carrots, and onions, then laid the roast among the vegetables. I sprinkled the seasoning packet over the corned beef and poured in some water and a half can of beer before shutting the lid and setting the dial to low. I arrived home to the delicious aroma of the complete dinner. There is nothing quite so wonderful as having dinner ready when walking in the door after a long day at work. 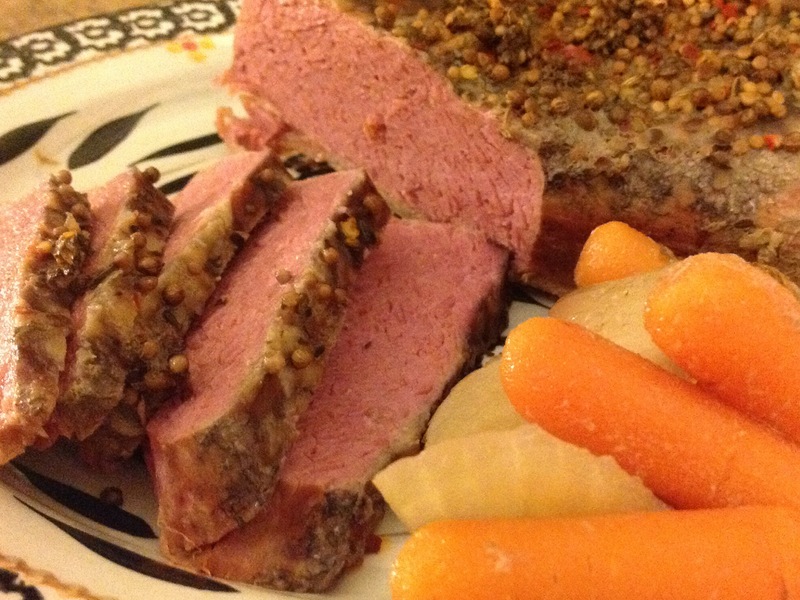 I have quite a few recipes to successfully cook corned beef. I often bake it or boil it, but this is one of my favorites…very little time or effort produce a magnificent meal. If you like Reuben sandwiches, add thousand island dressing and sour kraut to some toasted rye bread and you have quite a sandwich. 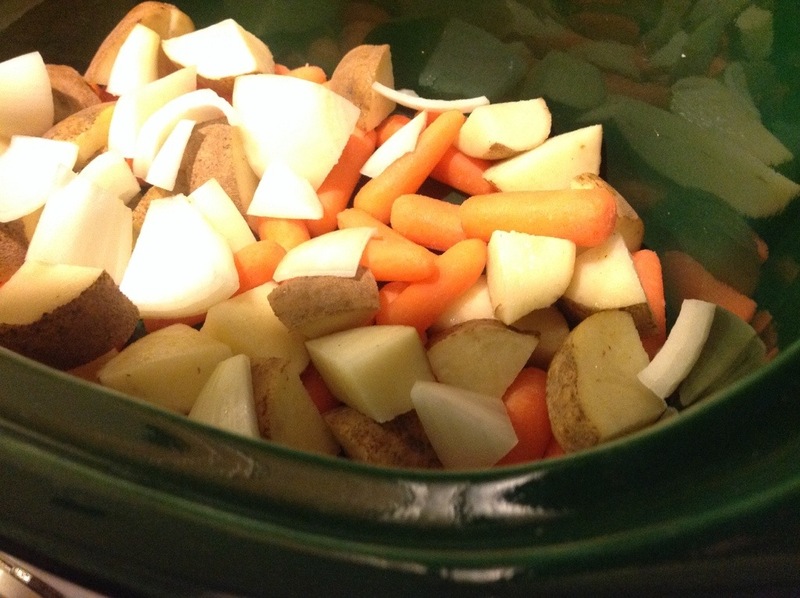 Place the carrots, potatoes, and onion into the bottom of a slow cooker. Place the brisket on top of the vegetables. Pour the water and beer over the brisket. Sprinkle on the spices packet, cover, and set the cooker on High. Cook the brisket for about 8 hours. Cool slightly before cutting into thin slices. There is nothing like walking in the door after a long day of work knowing that dinner has been simmering in the crock pot all day and the aroma of barbecue fills the air. These past few weeks, I’ve been working long hours and the unbelievable weather has made for some long, white-knuckled travel, here in the Midwest. Coming home, realizing that dinner is nearly ready is a saving grace. Pork roast can be found at your local grocer, usually at a decent price, when it’s on sale. I try to stock up on the long, lean roast by slicing it in chunks about 6-8″ long; enough to fit comfortably into the crock pot. I wrap the meat well and pop it into freezer bags to be stored in the freezer for satisfying crock pot recipes. 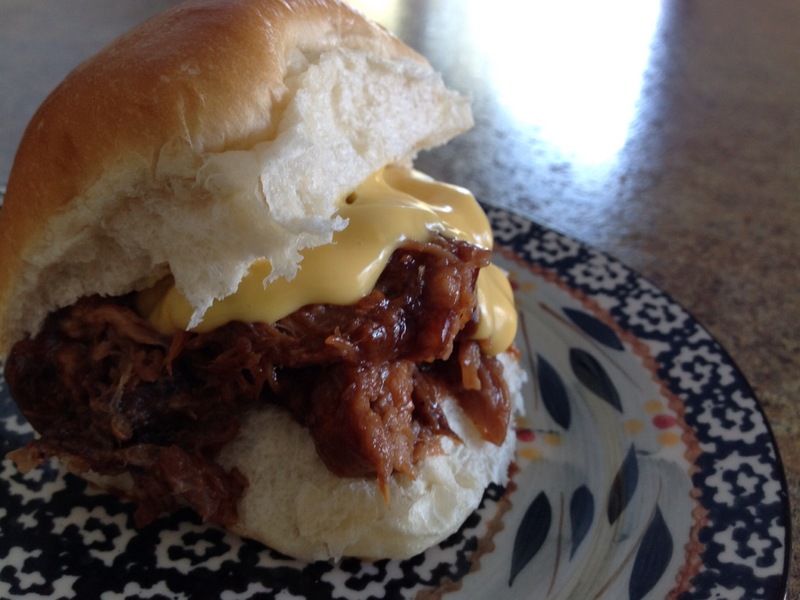 Use your favorite barbecue sauce for this recipe. We like Sweet Baby Ray ‘s. It seems to be just the right flavor to suit my family. Spray bottom of slow cooker with cooking spray. Put the roast in the cooker and pour in 1 cup barbecue sauce, apple cider vinegar and broth. Stir in remaining ingredients. Cover and cook on High for 5 to 6 hours. Remove the roast from the slow cooker, and shred the meat using two forks. Return the shredded pork to the slow cooker, and stir the meat into the juices. Add reserved barbecue sauce for extra flavor. My kids seem to be addicted to granola. If I had to buy it pre-packaged every week, I’d be bankrupt. Thankfully, I have several recipes for this crunchy, delicious and versatile treat. We use it to top yogurt or ice cream, add milk (cold or hot) to eat it as a breakfast cereal, and mix it with sweet and salty treats to make a trail mix. What I like about this recipe is that you can set it in the crockpot and let it cook for a few hours without heating up the house with the conventional oven during the summer months. The key is to slightly prop the crockpot open with a wooden skewer. This tiny opening lets the moisture out but keeps the heat inside the liner. Stirring the mixture every 30-35 minutes is also the key to success. 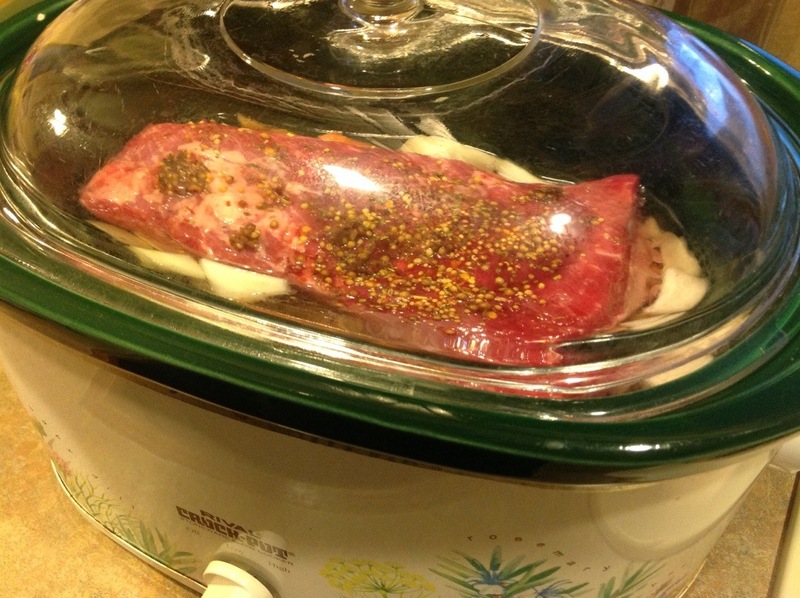 Spray the liner of the slow cooker with cooking spray. In a separate bowl, mix oats, vanilla, honey, syrup, and canola oil. 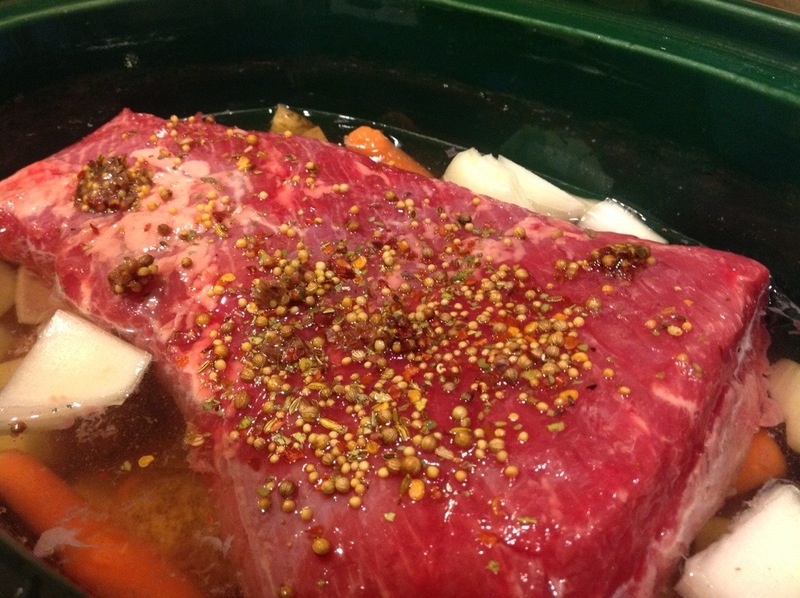 Pour into prepared slow cooker. 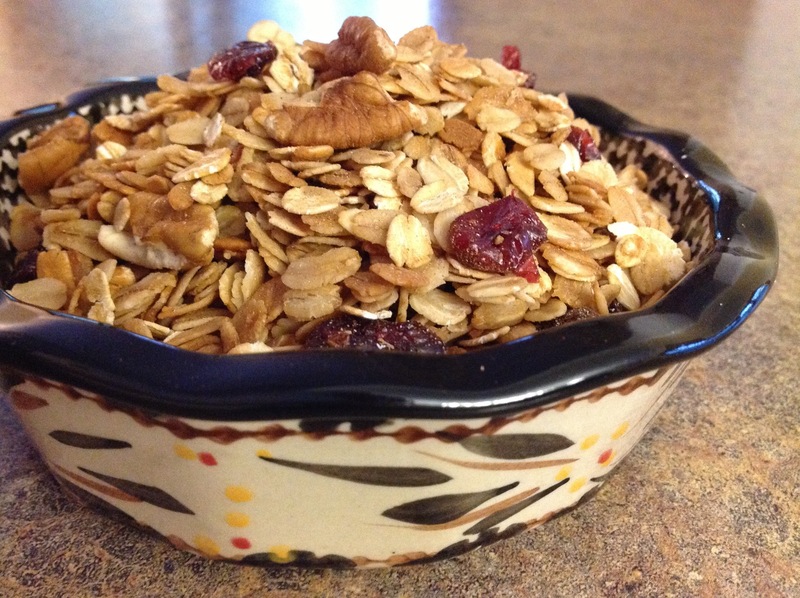 Cook the granola on low for 2 1/2-3 hours, venting the lid slightly. ( I use a wooden skewer.) Stir mixture well every 30-35 minutes. Cook until golden brown and quite dry. 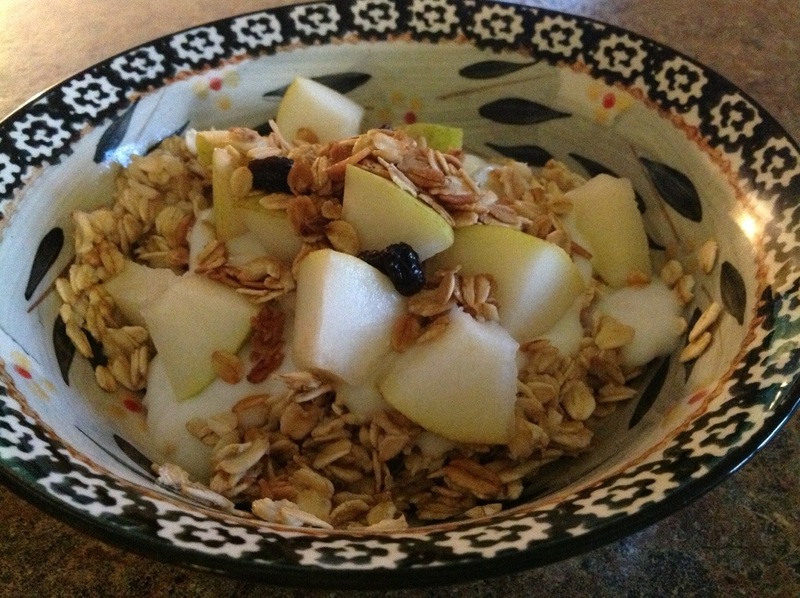 Pour the finished granola onto a baking sheet lined with parchment paper and allow to cool completely. Add pecans, cranberries, or raisins if desired. Store in an airtight container. I saw this recipe as I was searching for an interesting sub recipe last week. This one caught my eye because it looked so unique. On Saturday, I loaded up the crock pot with a variety of similar ingredients to make a mighty tasty sandwich. There were a few things that I might rethink next time, though. First off, I have to figure out a way to add more ingredients to each of the sandwich sections. 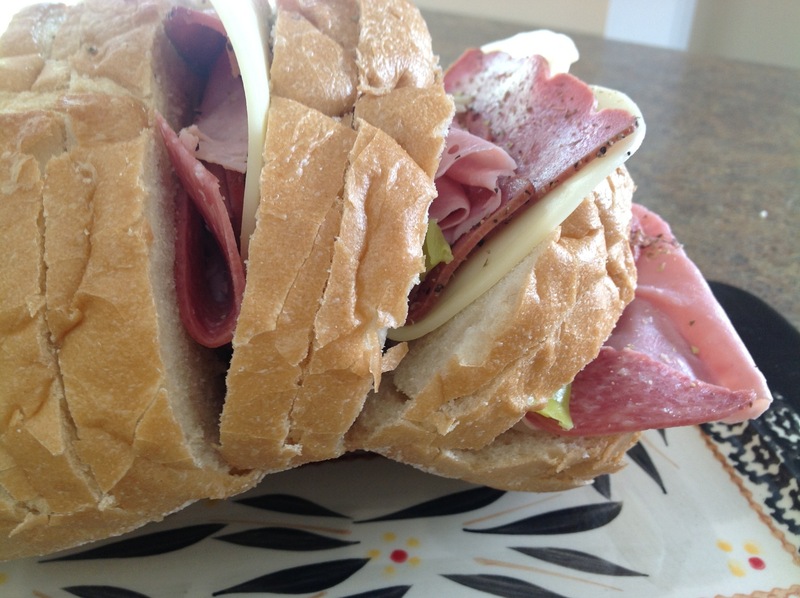 While I packed in as much as would fit, the sandwiches seemed a bit skimpy when I separated them from the loaf. Other than that, this thing was great! I am going to try it again today now that I have finished my trial run. Below, I have printed my recipe for the ingredients to be used for the crock pot grinder. 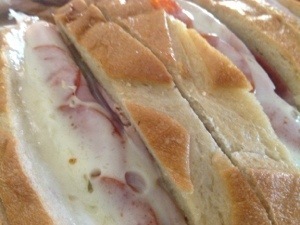 Partially slice Italian loaf to resemble sandwich slices. (Do not cut through the bottom of the loaf). Layer sandwich meat, cheese, onions, tomatoes and peppers in individual piles.Sprinkle with oregano. On a cutting board, carefully pack each pile of ingredients into the sliced loaf making sure to fill only every other opening. Double wrap the loaf in aluminum foil; making sure to fold and close edges firmly. Pour 1/2 cup water in the bottom of the crockpot. Place a heat proof bowl in the bottom of the pot to keep the sandwich above the waterline. 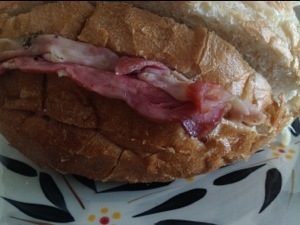 The water will steam the sandwich as it cooks. 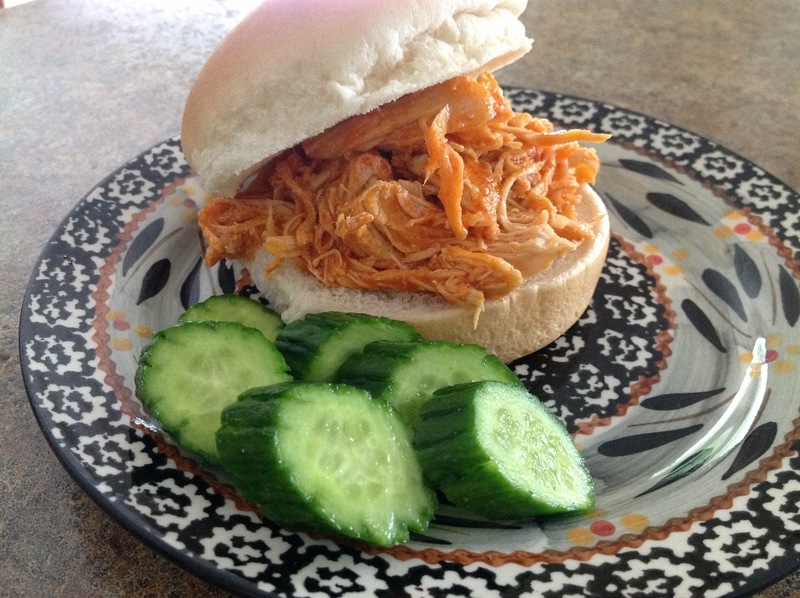 Place the sandwich into the crockpot. Cover and cook on LOW temperature for 4 hours. I just finished making the grinder a second time and boy it turned out great! 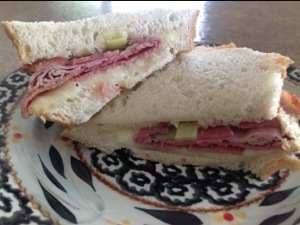 I added pepperoni to the sandwich meat slices and used mild, Chicago style giardiniera to spread on the bread instead of the onions and peppers…ooey, gooey, melted cheese and lots of Italian flavor. While Memorial Day weekend is usually all about grilling and opening up the pool for the summer, it seems the weather doesn’t necessarily feel like cooperating this year. After a beautiful morning sunrise, yesterday’s weather turned cloudy and a bit chilly. Instead of grilling, as I had planned, I popped a roast into the crock pot and headed outdoors to spruce up the backyard. This recipe couldn’t be any easier to prepare. I always keep these seasoning packets in the pantry for when I’m in the mood for a no-hassle meal. 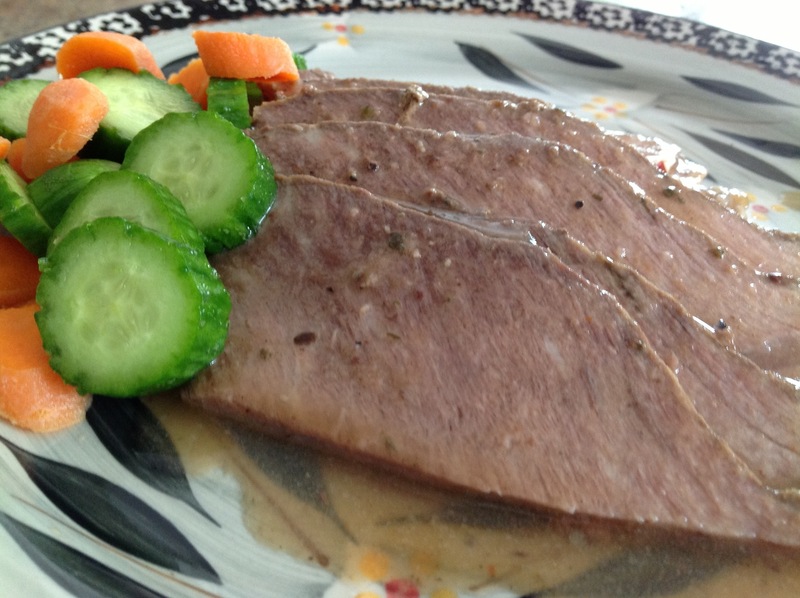 This is one of the most tender and flavorful roast recipes that I have ever tasted. In a mixing bowl, combine water with the three seasoning packets. In a lightly sprayed crock pot*, place roast beef. Pour seasoning mixture over the roast and cook on low for 6-8 hours. * I use a 6 quart crock pot for a 5 lb. roast. Three simple ingredients, one delicious sandwich! If you like spicy, this sandwich is for you. On chilly fall mornings, when we head off to the Northwestern or Purdue University football games, this is one of our favorite take-alongs. I just unplug the crock pot and pack this deliciousness into the back of the car. Yesterday, after days of warmer than usual weather, the skies turned gray, the heavens opened up, and the strong winds brought a stiff chill to the air. It reminded me so much of a fall morning, I pulled out a few chicken breasts and plugged in the crock pot. By the time the kids came home from swim practice, the chicken was done and the sandwiches were ready. That’s my kinda meal! 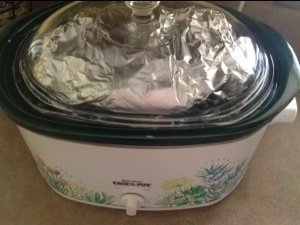 Place the stick of margarine or butter in the bottom of a 4-6 quart crock pot. Then add the chicken breasts. Cook on low setting for 6-8 hours, covered. When chicken is thoroughly cooked and quite tender. Shred the chicken with two forks. Pour in the bottle of Frank’s Red Hot sauce and combine well. Serve on your favorite sandwich rolls. I have three swimmers in the household so I am constantly replenishing the food supply. Swimmers are a dedicated breed. They are out of the house every weekday morning at 5:00 am and they stroll in the door around 6:00 pm every evening. This means I need to provide them with plenty of food during the school day so that they have enough energy to make it through until dinner. I send breakfast, lunch, and afternoon snack with my children every day. Packing three meals for three kids everyday can be a trying task. This recipe is nutritious, hearty, and packed with lots of whole grains and plenty of protein. Throw all of the ingredients in the crock pot before heading to bed. Wake up to the irresistible smell of cinnamon, apples, vanilla, and raisins. 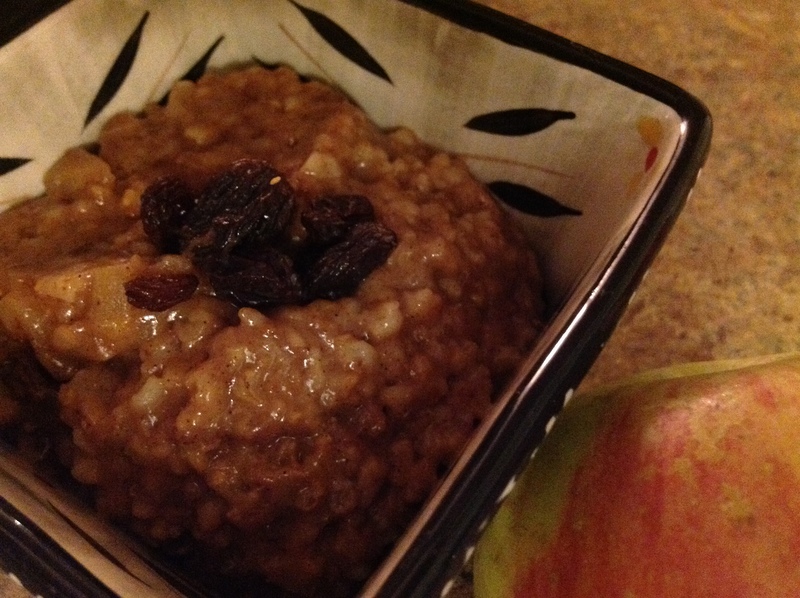 Pack warm oatmeal in individual plastic freezer jars and pop them into the fridge or freezer. During the week, pull a jar out of the fridge and pop it into the microwave for a delicious, hearty, breakfast that packs a powerful punch and is sure to get you through the morning. In a medium bowl, mix all ingredients thoroughly. Pour into crock pot sprayed well with cooking spray. Cover pot, set to LOW and let cook for 6 hours or until smooth and creamy. YUM!